Florence is the capital of Italy’s Tuscany region, and is the abode of all the great masterpieces that came up during the Renaissance era. As such, the city is replete with a lot of art and carefully preserved heritage. Some of the biggest attractions of the city are the Duomo, a famous cathedral with a terracotta tile dome, and Michelangelo’s famed “David” sculpture. If you’re in Florence, you should stay in a luxury hotel that can sync with the spirit of the city, while also being well located. 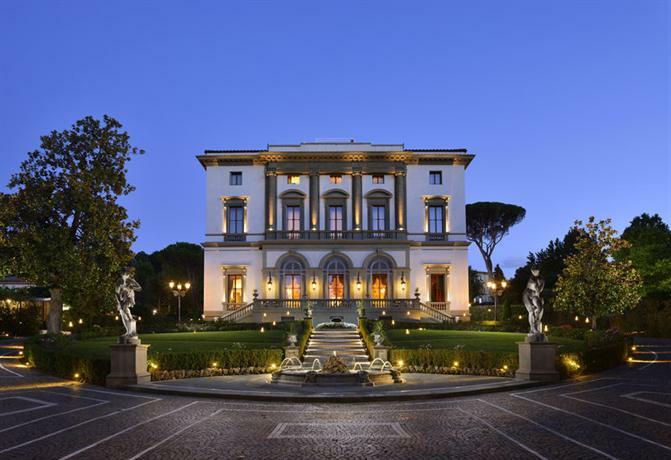 In this article we’ve compiled some of the best luxury hotels in Florence to help you make a decision! 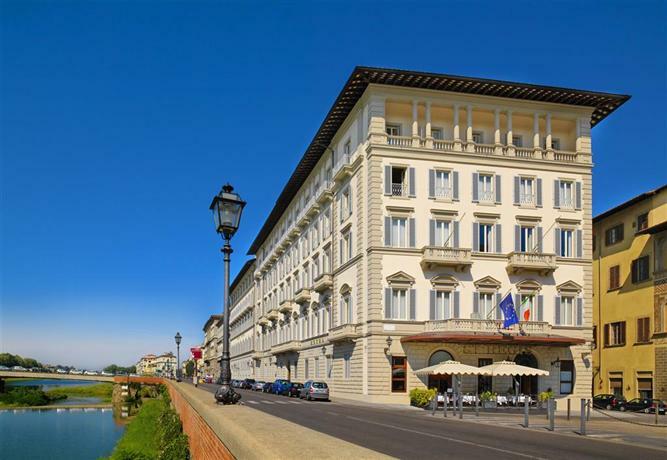 This luxury five star hotel is located quite a distance away from the city center, situated on the northern stretch of the avenues that lie between old Florence and the new suburbs. However, if you’re a keen walker you can cover the distance to the Duomo within fifteen minutes. The hotel has been built over two separate building structures. The main building is based on a 15th-century Palazzo della Gherardesca, and the other base structure is a former sixteenth-century convent, boasting one of the city’s finest gardens. If you check into the latter building, that is La Villa, you get access to your own butler, in addition to a private entrance from the street. The decor around the hotel is luxurious yet appropriately antiquated, replete with oil paintings and old sculptures. There are 116 rooms in the whole hotel, and they’ve all been designed in such a way so as to have a distinct personal identity, and also be well removed from all the noise of the world outside. The rooms are all decorated luxuriously with plenty of silk, velvet, and marble tiles. If you’d like to be in a part of the hotel with more scope for interaction with other guests, you should steer clear of the more solitary Conventino annex, and instead get a room in the main Palazzo. One of the greatest attractions of this trendy luxury hotel is the fact that it’s situated in a prime central location of the city, very close to all the main tourist spots, and smack right in the center of the boutique streets of the city. Before it was the St Regis, this used to be the Grand Hotel, and had been built with an old-world grace in mind. However, having been revamped in 2011, it is now a lot more contemporary and stylish in nature, though it still retains some of its classically Florentine accents. You can sense the warmth and friendliness of the hotel right from the lobby area, which doubles as an open library, and has a receptionist seated affably on a table rather than behind a looming desk. As such, they provide service that is extremely efficient and professional, yet is able to manage an easy charm and grace in execution rather than the stiff formality found in most hotels. If you’re staying in any of the suites, then you also get access to your own private concierge service that can be called upon any time of the day or night. The rooms are all different, so you should choose one which suits your needs. 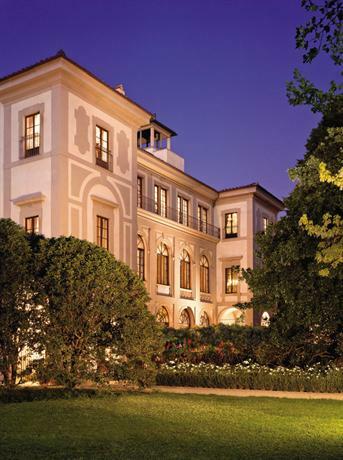 You can get a river view suite, or you can opt for one of their more stylish suites — the Bottega Veneta suite. The choice is yours, depending on availability of course. 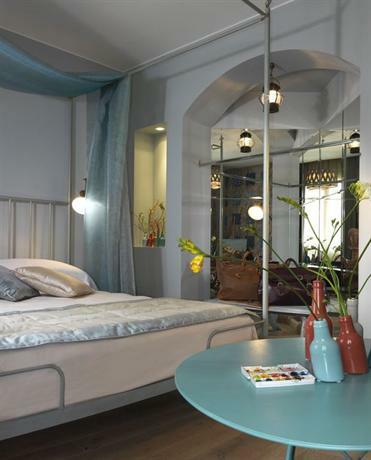 This trendy hotel is situated in a really hip location on Piazza Santa Maria Novella. This is within the neighborhood of the trendy Via Tornabuoni, which is famous for its boutique restaurants, and cafes. A ten minute walk can bring you to the attractions of Duomo and Ponte Vecchio, and you’re also within walking distance of Santa Maria Novella station, and as such you can be connected to the rest of the city easily. The interiors of the hotel features a pleasant fusion of contemporary and classical stylings, across several cultural accents. For example. the hotel is replete with French and Italian antiques, but in addition to that you might notice certain Moroccan lamps, or Chinese designs on sideboards. The check-in and check-out system is quite casual and occurs in the lounge to the accompaniment of some refreshing drinks. The general manager of the hotel — Claudio Meli — is extremely helpful and insightful, and he has compiled all his vast fount of local knowledge into a guidebook which he hands out to all the new visitors free of charge. This boutique hotel features 20 rooms, and they’ve all been designed in a charming 20th century retro styling, with the generous use of expensive and lavish materials such as linen sheets, an antique fireplace, oak parquet floors, etc. Their on-site restaurant J.K. Lounge is quite casual yet efficient in style, and they serve an interesting mix of local and international cuisines. This luxury hotel is located on the Piazza Ognissanti, and it’s a short walking distance away from the hip and trendy shopping center of Via Tornabuoni. You can even walk over to all of Florence’s other major tourist destinations such as the Duomo. If you’re looking to explore artworks, then Domenico Ghirlandaio’s Last Supper fresco is located within one of the cloisters in the same area. The hotel recently went through a refurnishing, which has really helped it better blend into the contemporary world, without sacrificing on its Florentine charm. As such, the hotel now boasts grand revolving doors, stained-glass windows, etc, and all the other classical details, however the furniture and the guest rooms have been updated so as to be more contemporary and comfortable in style. For example, the bathrooms have been enhanced with chrome installations, and the color palette has been modified into one of space grey with taupe, as opposed to the pastel shades used previously. 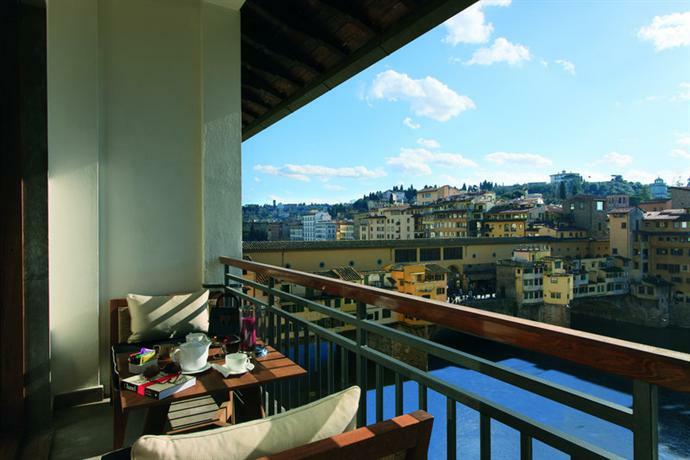 If you get one of the suites facing the river, you can look out at the Ponte Vecchio up to Forte Belvedere, this panoramic view is truly one of the best the city has to offer. As far as restaurants are concerned, the sixth floor of the hotel has a lovely area called Sesto on Arno, which is really a glass box from which you get a complete 360 degree view of the city around. This boutique hotel is located on the road leading to the Porta Romana town gate. As such, it’s surrounded by a green park all around, and a 15 minute walk can bring you to Ponte Vecchio. However, if you’re looking for city view rooms, this is not the place for you because the roof terrace is the only part of the hotel with a city view. The hotel is considerably grand and opulent, which is owing to its personal history, having been owned by Emperor Napoleon III’s widow Eugenié, and as such the main villa is a true sight to see, with trompe l’oeil frescoes, vast gilded mirrors, parquet floors, tinkling chandeliers, and even reception rooms designed in Art Nouveau stylings. The various buildings of the hotel are connected via an underground tunnel system as well, which is a helpful detail during rainy seasons. The park surrounding the buildings is lush and beautiful, boasting over a 100 rose species alone. The hotel’s on-site spa is perhaps one of the top five in the whole city, and the open air pool is always heated. The on-site bar also features a lovely grand piano that any of the guests can make use of, if they are so inclined. There are 46 rooms in the whole hotel, and they’ve all been designed in an individual style. 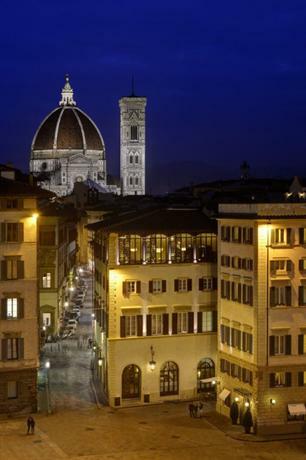 This hotel is beautifully located right across from the biggest attraction that Florence has to offer — the Duomo. It’s so close that when you look out of the street facing windows, you get an unhindered view of the buttresses and towers of the structure. The hotel feels quite palatial, and sometimes it even feels somewhat like you’re in a museum with vast sprawling floor-to-ceiling frescoes painted everywhere you look. The palazzo is owned by Ginevra Niccolini, and she is a stunning personality, always at hand to welcome guests and make them feel at home. As such, calling this a ‘hotel’ feels almost like a disservice. This trendy luxury hotel is located right next to a river, and as such the Arno-facing rooms get to enjoy a truly lovely view. However, this is also one of the most busy thoroughfares of the city, and as such it’s the furthest things from quiet or peaceful. There are three villas that come together to form this hotel. The hotel also comes with a lovely pool surrounded by a lush garden, and a basement spa which smacks of ancient greek decadence. The hotel has 45 different rooms, all designed in different styles and with differing amenities. 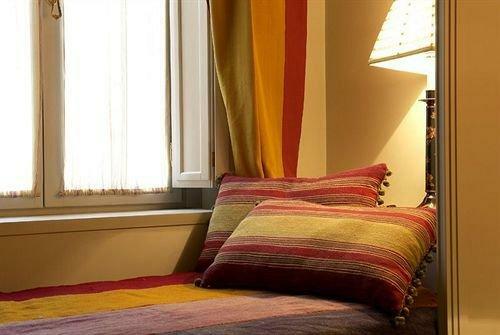 This lovely boutique hotel is on the Oltrarno, which is located on the south side of the river, and is the more posh and cultured hub of the city, which is great to explore antique emporiums, or go shopping for arts and crafts. This palazzo had been bought over by a marquis in 1770, and as such its style is full of pomp and luxury with ceilings laden with intricate chandeliers and sofas and rugs that feel ancient and regal. You can also partake of the entertainment of the billiard room, or work out in the on-site gym, both of which are open 24/7. There are only 12 lavishly decorated rooms in all, and this also gives the palazzo a very intimate vibe. 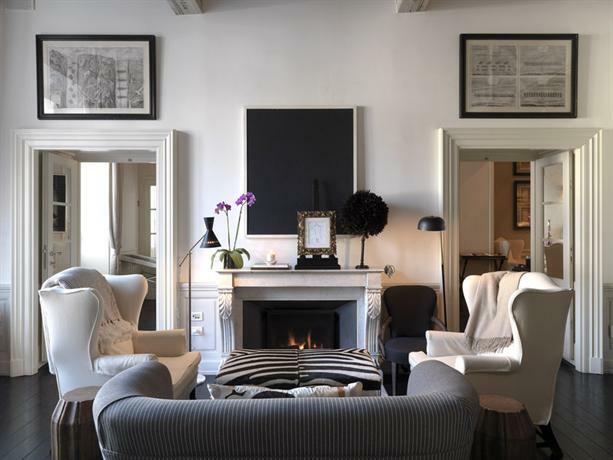 Located just a little off Ponte Vecchio, this luxury hotel is situated in perhaps one of the most important and grand sites in all of Florence. A two minute stroll can bring you to The Uffizi, which features a lovely art collection, and you can also walk up to Piazza della Signoria, which is famous for its boutique cafes and restaurants. The color palette favored by the hotel features a mix of neutral shades such as grey, beige, white, and brown. The walls are all whitewashed and feature lovely black and white photographs of famous stars visiting Florence. All the 36 rooms of the hotel are large and sprawling. 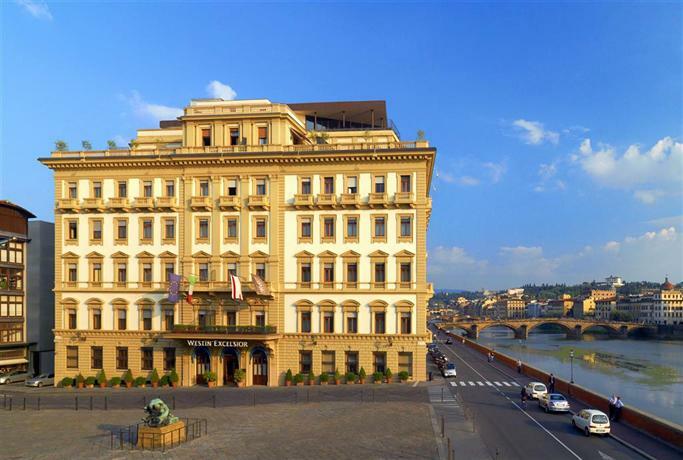 This luxury hotel has one of the most beautiful locations in all of Florence, situated right on the river itself, and a short stroll from Ponte Vecchio. The interiors have been designed in a lovely blend of Americans and European stylings, a good mix of American masculinity in the lounge area and the bars, juxtaposed with Fresh touches in terms of the artworks and photographs in the rooms and the hallways. There are 78 rooms in the entire hotel, and they all vary in size, but are all equally trendy and stylish in their aesthetics. This hotel is located at the very top of Via Tornabuoni, and is really quite close to prime attractions such as the Arno and Ponte Santa Trinità. The immediate neighborhood of the hotel is stylish and chic with outlets such as Prada, Armani, and Gucci just across the street, and plenty of charming cafes and restaurants as well. 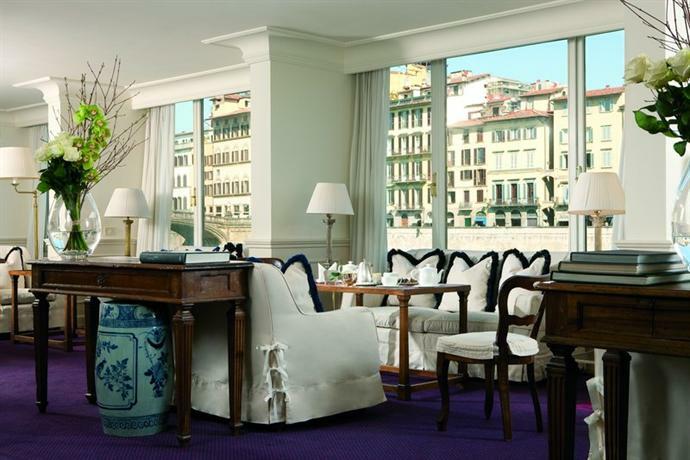 The hotel comes replete with vast sprawling terraces that either face towards the river or towards the Duomo. There are 24 hand-painted rooms, with oriental rugs, bold color palettes, and stunning views all around. This hotel sits on the corner of the street across from Ponte Vecchio, which makes it a very well connected hotel in the midst of all the action, but as a result you also have to suspend your need for peace and quietude to some small degree. The hotel has been primarily designed based off the stylistic influences of the 1950s and 60s. 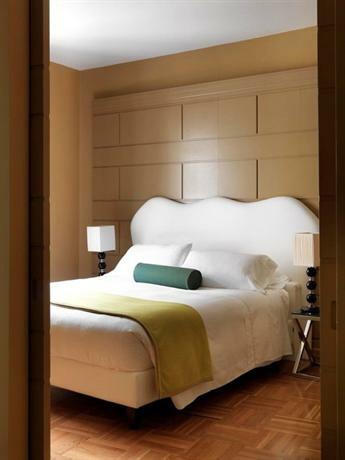 The rooms are incredibly sleek and stylish with a soothing color palette of white, leather, teak, and beige. As such, these 43 rooms can be used as a retreat from all the noise and activity of the streets down below. This is a lovely palazzo located on a pedestrian-only street, and is right across from Porta Rossa. The hotel has been primarily designed in a European Contemporary aesthetic, however it features touches of classical grandeur in the form of the beautiful frescoes sprawling along the walls, and the presence of roof beams in some of the more luxurious suites. The boutique hotel features 72 rooms, and they’ve all been created in a beige and cream aesthetic, with dark wooden floors, and stunning scarlet and crimson furnishings. This creates an aesthetic that is at once soothing yet regal. 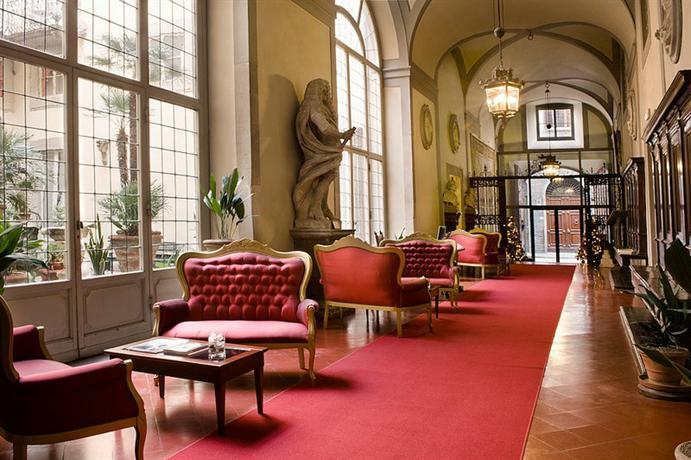 This luxury hotel is located smack right in the center of the city of Florence, well within walking distance of the Santa Maria Novella train station. As such it’s very well connected to the rest of the city. The boutique hotel has been designed in a townhouse aesthetic, and true to that image it also features a wooden fire, and a hotel library that guests can browse through. There are 44 rooms in the whole hotel and they’ve all been designed in neutral earthy shades. The street facing rooms offer a great view of the hotel, however all the rooms are equally stunning in terms of amenities, space, decoration, etc. 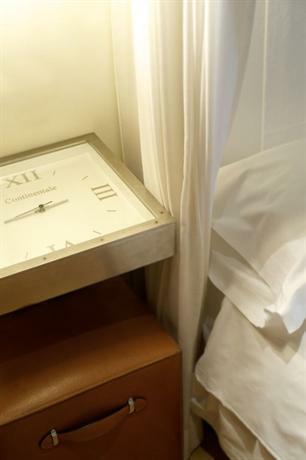 This hotel is also very well connected, located on the Piazza Santa Maria Novella, and just a few minutes from the Santa Maria Novella train station. The interiors of the hotel have been designed in a classical Renaissance style, and all the 54 rooms of the hotel have been designed after different Swiss watches, in a quirky move that speaks of the owners private interests and personality. However, even though they’ve all been built in the image of Swiss watches, what truly makes them appealing is the autumnal hues used to decorate every facet of the hotel, in a manner such that it’s classy yet subtle.